I love peanut butter. Like really LOVE it! I could eat it with a spoon right out of the jar (that’s how much I love it). 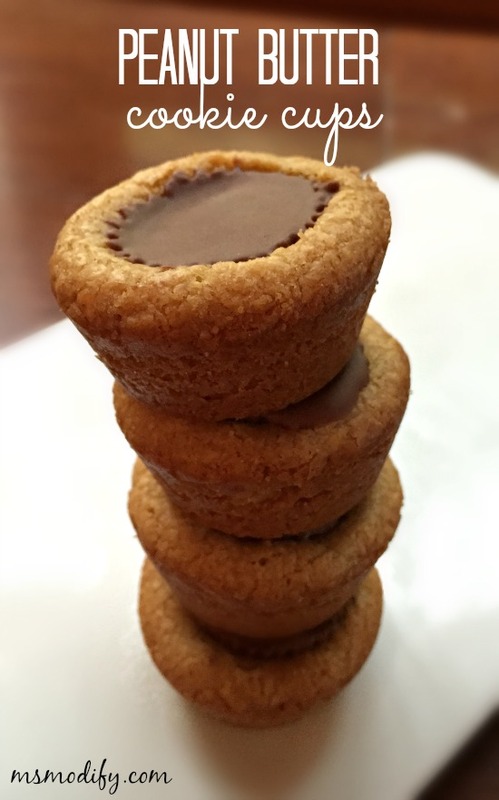 One day I was watching The Pioneer Woman on TV and she made this super easy peanut butter cookie cups, instantly I knew I needed to modify them so I could eat them! 🙂 Peanut butter cookies + Reeses Peanut Butter cups… wow it doesn’t get much better than that! Just a warning: you might be tempted to eat all 24 cookies in one sitting! The refrigerator cookie dough that I used comes pre-cut for 12 large cookies. So, cut each one in half and roll into ball. Place dough ball into greased mini cupcake tin. Bake the cookies for 10-12 mins, or until they start turning golden brown. (While cookies are baking, peel off the wrappers from the Reeses Pieces Cups). As soon as you remove the cookies from the oven, lightly press down each Reeses Pieces into each cookie. The warmer the cookie, the better! Let cool then remove from pan. This entry was posted in Recipes/Dining Out and tagged cookies, dessert, peanut butter. Thanks! I did post a vassilopita recipe (http://msmodify.com/gluten-free-vasilopita-lucky-greek-new-years-cake/) I’m not sure if you saw it. Funny you mention this, because I created something I’ll be posting soon (a twist on spanakopita). I’ve been playing around a lot with my yiayia’s recipes and am hoping once I’m happy with how they turn out I will share them.